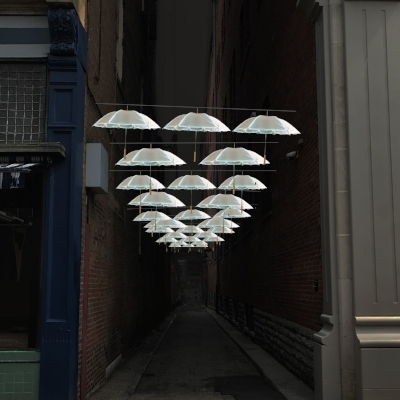 Easy Breezy consists of a canopy of white umbrellas outlined in different colored EL lights that will be lit each night of BLINK. When guests walk near or under the umbrellas, the umbrellas gently sway back and forth and the umbrellas appear to dance. Mallory Feltz (1983) is a visual artist from Dayton, Ohio who is interested in a wide range of materials and has always enjoyed building things. She earned her BFA in Sculpture from the University of Cincinnati, DAAP in 2006. She attended Louisiana State University to complete her MFA in Sculpture (2009), and in October 2007 was awarded Honorable Mention in the Outstanding Student Achievement Awards from the International Sculpture Center.